Catch me around Clarksdale, Mississippi on April 12 and 13 for the world famous Juke Joint Festival! I will be playing Fender electric 12 string with Grant Smith on calabash. The best of the best in Mississippi blues will be playing from Thursday-Sunday. 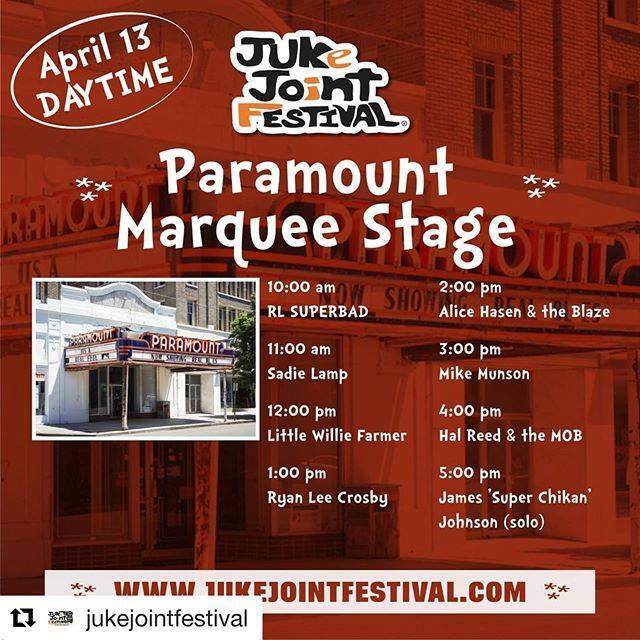 We are thrilled and honored to be a part of Juke Joint Festival. See you out there! Clarksdale's annual Juke Joint Festival is a one of kind experience for blues enthusiasts, drawing musicians and music lovers from all over the US and around the world. Featuring some of Mississippi's finest blues musicians as well as artists from beyond the Delta and a wide variety of related events, it's not to be missed! Related Events run Thursday-Sunday April 11-14, and the main event itself is all day/night Saturday the 13th — with 13 daytime music stages, 20+ nighttime venues, 100 blues acts, 100 street vendors (food, arts & crafts, etc. ), petting zoo, rock wall, history bus tours, educational events, racing pigs, monkeys riding dogs and much more. One of the friendliest festivals in the world, Clarksdale's Juke Joint Fest is "half blues festival, half small-town fair and all about the Delta!"